A couple of notes on my piece in Breitbart Sports today. First, it is amazing how efficient Duke players are year in and year out at www.valueaddbasketball.com, and I saw some of the fundamentals in non-conference play and more recently that I believe play out at a higher level as freshman turn to sophomores. So if Wojo is building "Duke North" I will take it along with all the haters who could come with it. 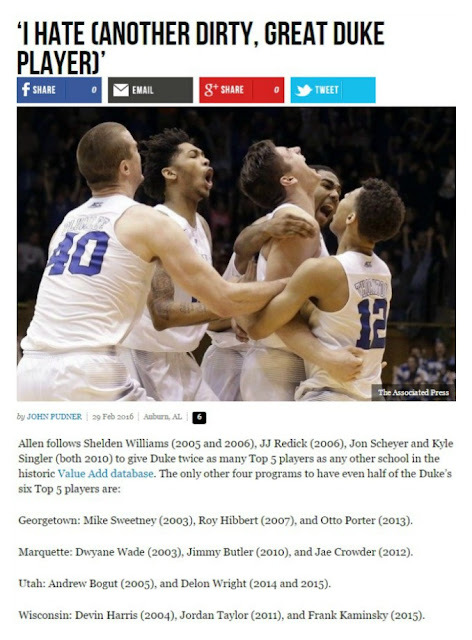 Second, while Duke dominates the historic database going back to 2003 including six top 5 players, note in the verbage below that Marquette is one of only four other teams with three such players. We have been spoiled by Dwyane Wade, Jimmy Butler and Jae Crowder - and it is quite possible that if Henry Ellenson did decide to stay for one more year he could be the fourth top five player for MU. His shot from outside the top 1000 in the early season to 270th today bodes well for the typically huge sophomore jump great players have.